“Westworld” has slowly revealed its underlying mystery throughout Season 2, and in the fourth episode, “Riddle of the Sphinx,” we finally found out the secret plan of why the park was built. Up until now, there have been hints that certain elements — namely, Charlotte Hail (Tessa Thompson) — have been sneaking secret data out of Westworld using hacked hosts. In Season 2, we also saw how William convinced James Delos, the head of the corporation that invested in the host technology that runs the park, to pony up to make Westworld happen. At first the plan was to use Westworld to gather information on the guests and use it for marketing, blackmail or other insidious purposes. But now we know that info might have had a different purpose… and it throws into question a lot of what we’ve seen in “Westworld” up to now. What was revealed in “Riddle of the Sphinx” dovetails with what we learned about Bernard (Jeffrey Wright) last season, that he was something of a copy or an iteration on a real person. In Episode 4, we find out that Delos has been using Westworld’s technology in hopes of creating a means of people reaching immortality. 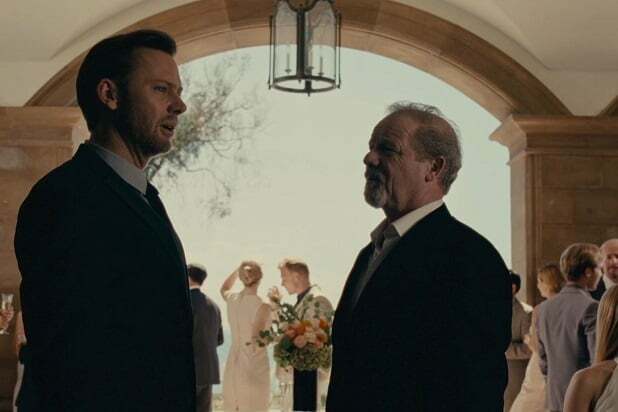 Throughout the episode, William (played by both Jimmi Simpson and Ed Harris in his older, Man in Black iteration) has been attempting to resurrect James Delos, William’s father-in-law and the owner of the company, as a robotic host. It turns out that the real thing William sold Delos on 30 years ago when he purchased Westworld was the idea that human minds could be downloaded into a host. William has been trying to make good on that goal ever since, specifically trying to resurrect Delos, who died of an unnamed disease years earlier. Like something out of “Black Mirror,” Westworld technicians have downloaded Delos’ mind into host after host, trying to resurrect the company’s original owner in a new, robot body. But while William was never able to resurrect his father-in-law, Ford (Anthony Hopkins) had some success with the idea — in Season 1, it was revealed that Bernard is actually Arnold, the co-founder of Westworld and the creator of the robot technology that makes the hosts possible. What we don’t know is whether Bernard is an actual copy of the original Arnold’s mind, like the host version of Delos was, or just a reasonable facsimile created by Ford. Given the events of “Riddle of the Sphinx,” though, it would seem the latter is probably the case. Somehow, Ford figured out what William’s scientists never could: how to transfer a human mind into a host body. As we see in Bernard’s flashbacks in “Riddle of the Sphinx,” though, Delos was probably not the only human Ford that the technicians of Westworld were trying to recreate. In fact, Bernard remembers that right before Ford executed his plan to allow the hosts to take over the park, he made Bernard create another “control unit” to transfer a human consciousness into a host. In all likelihood, that person is already in the park — so who could it be? The obvious first guess is Ford himself. His last words were, “Mozart, Beethoven and Chopin never died. They simply became their music.” For Ford, transferring himself into a host would accomplish the same thing, in a very literal sense. He would become his creation. This also raises the question of what else William intended to do with the guest data he was gathering. Could it be possible that the reason the hosts are so human is that they’re not hosts at all, but copies of real people? After everything we’ve seen, that seems possible. So who else has been copied, and more importantly, why? It really seems that there has to be more to the Man in Black wandering through Westworld than just hoping to find a game that has higher stakes and finally makes him feel something again. After all, he devoted 30 years of his life trying to resurrect his father-in-law, seemingly out of a feeling of loyalty — so there’s probably more going on with him than meets the eye.